As D.C. & MD's experienced HVAC contractors, Complete Home Solutions provides a variety of heating, air conditioning and indoor air quality services. Contact us today for a free estimate to install a heating recovery or energy recovery ventilation system in your home. We serve Annapolis, Glen Burnie, Pasadena and surrounding Maryland areas. 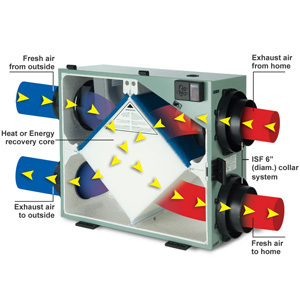 The technicians at Complete Home Solutions are trained to identify these requirements and design a customized indoor air quality plan for your home. We can measure your home’s air exchange rate and install an HRV or ERV if necessary. We’ll work with you to ensure the best-possible results: a healthy, comfortable home with lower operating costs. Call us at 1-855-247-9984 or contact us online to schedule a free estimate to have a geothermal heat pump installed by one of our experts. We provide HVAC services to customers in Annapolis, Glen Burnie, Pasadena, Rockville, Annapolis, Bowie, Bethesda, Upper Marlboro, Waldorf, Laurel and nearby Maryland.